Aside from loving May because of my birthday, I love it because of the mangoes. Mangoes are in season here in the Philippines every May, and yes, while they are available all year, the best mangoes are the ones you buy this month. There are hundreds, er, thousands of things you can do with mangoes. 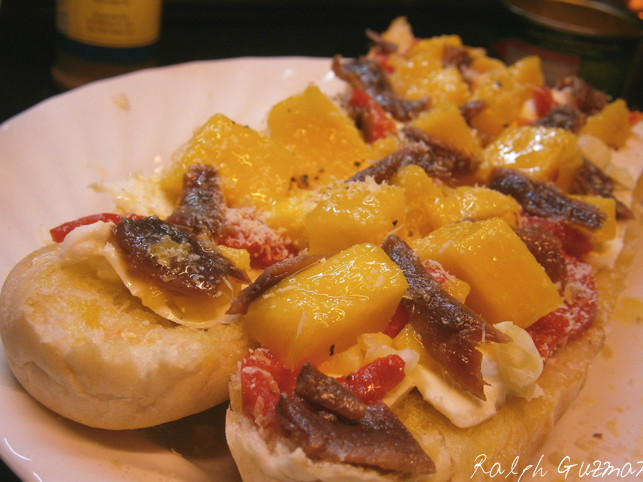 Let me add one more dish in the repository — Mango and Kesong Puti Bruschetta. I was craving for some bruschetta last weekend. However, I wanted a different twist to it. I also wanted a dish that was colorful and fun to look at, aside from being tasty and delicious. And so, the result is an antipasto that has a Filipino identity. It’s very easy to make. 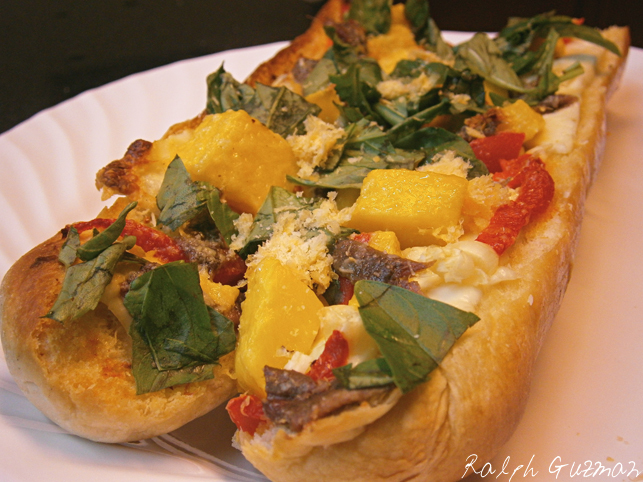 Ingredients: All you need as ingredients are a French baguette, kesong puti, mangoes, canned red bell pepper (pimiento) anchovies, butter, olive oil, pepper, garlic, parmesan cheese, and fresh basil leaves. 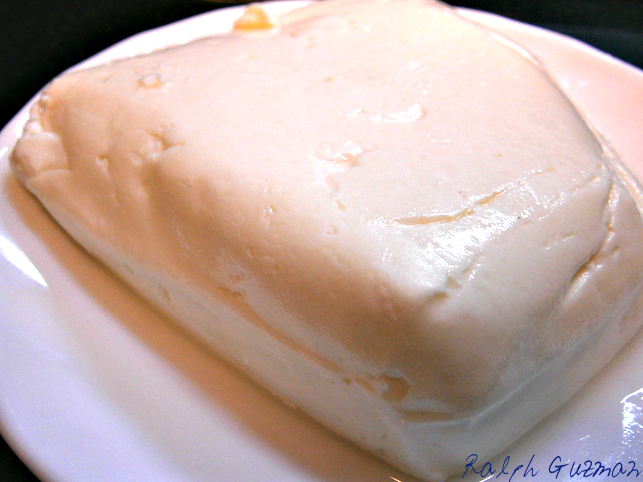 Kesong Puti (White Cheese): It looks like fresh mozzarella, doesn’t it? A note about kesong puti: Kesong puti (white cheese) is a local cheese here in the Philippines that is made of fresh carabao’s milk. If it is not available in your part of the woods, I would always suggest fresh mozzarella as the alternative. Feta can also be an alternative. What I love about kesong puti is how affordable it is, and of course, its delicious taste. Many people complain that this local cheese tastes very salty when eaten as it is, but it gets more creamy and less salty if you cook it. I love using it for bruschetta, salads, and pasta. Brush the baguette with a mixture of olive oil and butter. The olive oil makes the bread more crusty. 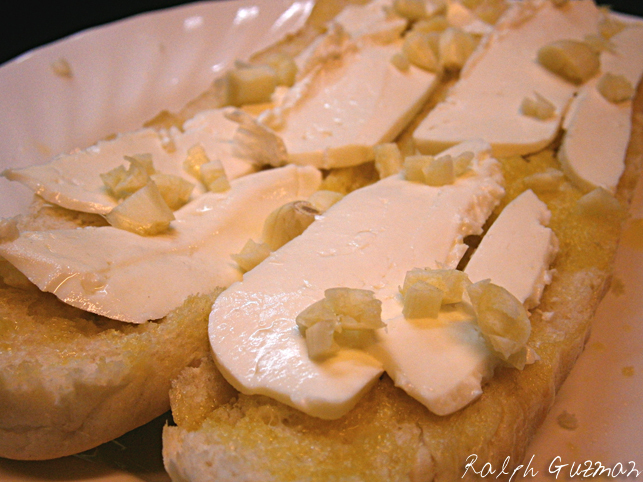 The top with thin slices of kesong puti and chopped garlic. I used 4 cloves of garlic for this one. 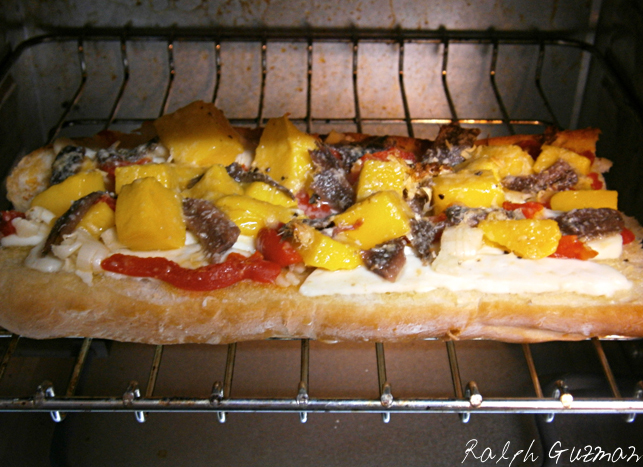 Chop the pimiento, mango, and anchovies. Then place them on top of the baguette as you would with pizza toppings. Season with pepper. Top with grated parmesan cheese. No need for salt as the anchovies are already very salty. You have the free hand with regard to the amount of ingredients you will put. Just don’t put too much anchovies for this will make your bruschetta too salty. Here’s how the pimiento looks before it’s chopped. I like using this ingredient. 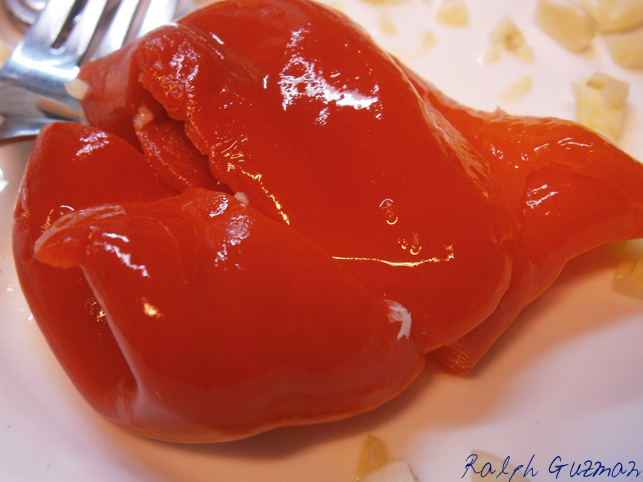 Compared to fresh red bell pepper, its canned counterpart is smokier in flavor. Plus, it has much longer shelf life. Bake in the oven at 175° C or 350° F for 10-12 minutes. Actually, an oven toaster will do the job very well too. After 10 to 12 minutes, take the bruschetta out of the oven. Top with chopped fresh basil. If you’re sharing the dish with people, slice the bread into smaller slices. You can, of course, have it as it is if you are eating it alone! This entry was posted in Food + Recipes, Salad + Appetizer and tagged Anchovies, antipasti recipes, antipasto, antipasto recipe, appetizer, Basil, Bruschetta, bruschetta recipes, filipino bruschetta, filipino food, italian recipes, kesong puti bruschetta, mango kesong puti bruschetta, Mango recipes, philippine cuisine, Philippine Mangoes, pimiento, pinoy bruschetta, ralph guzman, Ralph Guzman Foodie, ralph guzman recipes, RatedRalph, RatedRalph.com by Ralph. Bookmark the permalink.